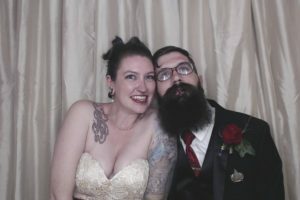 The Photomatic Photobooth | Best Photobooth in Wisconsin! I had the pleasure of sharing our photo booth with my brother’s wedding guests this past weekend! Ian & Rachel Got Married! We also have some cool new features to offer! The greatest one, for those that choose Facebook uploading, we now upload instantly as the pictures are taken! View, share, tag, download at the party. See what other guests have done, and try to top them! If you choose not to have Facebook uploading, your guests can email the photos to themselves right away instead, or post to their own Facebook page! We’re still adding and changing things all the time, we can’t wait to show you what’s next! We are heading into what looks to be a great summer! Summerfest has started with some great bands, the weather has been amazing, and it looks like the fishing has been good! So lets head into great summer weddings too! And every wedding needs a photo booth! There is no better way to catch those special candid memories and notes from your closest friends and family than a photo booth guestbook. Thank you and have a great summer!! Our wedding season starts this week. We’re so excited for the upcoming year! The booth has had a few “under the hood” upgrades over the winter, and we will be adding a few more fun things before the season gets in full swing. The word is getting out, our unique booth and amazing staff make a great addition to your wedding or event. We are filling up fast! Don’t wait too late to book us. A simple $50 deposit will reserve your day.